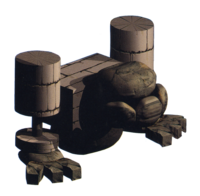 Corkpedite is a sand golem enemy in Super Mario RPG: Legend of the Seven Stars. The cork-shouldered beasts are found in Barrel Volcano. Corkpedites are immensely powerful creatures in battle, mostly due to their great physical attacks and defense. It is divided into two parts: a head (called the "Corkpedite" itself in the game) and a body (named the "Body"). Both parts have separate health points, so Mario must defeat both parts to completely defeat the creature. The two parts share resistances and weakness, but the head has superior stats, because it is the one that actually attacks. Once the head is eliminated, the Body will simply use Migraine on one of Mario's party members. Pyrospheres and Oerlikons are often fought alongside the creature in battle. Corkpedites can also be encountered outside of battle, unlike many large enemies in the game. They can be seen knocking Oerlikons from the ceiling by stomping the ground. There is an unused enemy named Pile Driver who shares the same sprite as the Corkpedite, only shaded blue. This page was last edited on October 30, 2018, at 11:52.